On October 26, Brighton Bank will begin mailing out new EMV MasterCard Debit Cards to our customers. These cards will come with a new card number, PIN, and will feature a new chip technology. These cards will not work until November 9, and you will continue to use your old Visa Debit Card until this date. *PLEASE DO NOT DESTROY YOUR OLD DEBIT CARD UNTIL NOVEMBER 9. *Below you will find some Frequently Asked Questions to aid you in this change. If your question is not answered below, please feel free to call us at 901-476-5353 and we will be happy to answer any questions you may have. Chip cards are based on a global card payment standard called EMV, currently used in more than 80 countries. There are more than 3.4 billion chip cards issued across the globe. 1. Insert your card with the chip toward the terminal, facing up. Do not remove until prompted. 2. Provide your signature or PIN as prompted by the terminal. Some transactions may not require either. 3. When the terminal says the transaction is complete, remove your card. At an ATM, start the transaction as you normally would and follow the prompts. A chip-enabled ATM will guide you through the transaction. Depending on the type of ATM, your experience may differ slightly. Refer to the directions of using a chip-enabled ATM in the questions above. 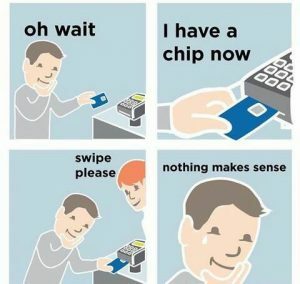 When will I be able to use my chip card at all merchants and ATM locations? Starting on November 9th, you will be able to use your chip card every day! More merchants and ATMs are becoming chip-enabled to increase security for in-person card transactions, so you will start to see these terminals and ATMs at many of the stores and financial institutions you visit today. You will continue to be able to pay at both chip-enabled and non-chip-enabled merchants and ATMs with the same card. Brighton Bank will begin shipping out the EMV MasterCard Debit Cards on October 26, 2016. Please be aware that the cards will not work until the November 9, 2016 date so please do not destroy your old Visa Debit cards until this date. Also note that the cards will come with a new card number and a new PIN. This will mean that all customers will need to update reoccurring payments they have on their debit cards with the new debit card number. Yes. Chip cards are widely used in international markets and are accepted in more than 80 countries. Having a chip card will make it easier for you to make purchases and complete ATM transactions and complete ATM transactions when you travel internationally. When searching for a site to shop, use familiar sites instead of using a search engine. Some search results are altered and can lead you in the wrong direction. Also if you know the site like Walmart or Target then they are less likely to be a scam. Some scammers will trick you in making the website appear the same and just changing the domain to make you think you’re on the normal website. Lastly, if something looks different than you’re used to, the best advice would be to not provide any of your information there. Most people will wait until they get their bill in the mail to check the information on the statement. A good thing to do is go online and check your checking account regularly just to make sure if there are any discrepancies you’re able to get those cleared up immediately. If you are online and see any fraudulent charges be sure to pick up the phone and address them with someone as soon as possible. Customers need to notify the bank within 60 days if they see a transaction that they do not recognize. Studies show that most adults use their mobile devices to compare prices before making a purchase. Make sure you use the app provided by that retailer such as Walmart or Target. When making a purchase if you are ever asked for you social security number or your birthday or any other strange personal information you should immediately be aware that this is some sort of a scam. Always try to give the least amount of information possible. This step just saves you from a lot of trouble. You should never buy anything from a website using your credit card that doesn’t have the padlock symbol at the top. 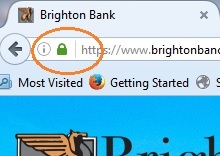 This padlock means that this website has SSL (secure sockets layer) encryption installed. Also if the site has SSL the URL for the site will start with HTTPS://. Another tip to remember is to never give your credit card number over email. In conclusion, if you ever feel uncomfortable with something, it is probably best to just not do it or do some research before proceeding. When shopping online there are many things to look for and be cautious about, but if you follow these safe online shopping tips, you can expect a better and safer shopping experience. As technology advances, so do the risks associated with it. Customers should be aware of identity theft and how to protect themselves against it. Below we have listed 7 ways to protect yourself from becoming a victim of identity theft. 1. Do not overshare information about yourself on social media. Even if you have social media accounts like FaceBook, Instagram, Twitter, etc. set to private, your information can still be obtained. Social media makes it easy for your friends to share information with other people outside of your friends list or to obtain the information themselves. We recommend setting your privacy settings to the highest level and avoid releasing information that could make it easy for someone to guess your security questions like your exact date of birth and your mother’s maiden name. If you’re even unsure if information you’re posting may become misused, it is best practice to avoid using it on social media. 2. Maintain Anti-Virus and Anti-Malware software. All personal computers should be equipped with the most recent anti-virus and anti-malware software. This protects your computer from outside invasions that could steal your information and even make your computer unusable. It is recommended that you allow these software programs to run their scheduled upgrades so you will be protected against the most up-to-date viruses, worms, and Trojans. 3. Be Careful with Your Personal and Financial Documents. It is important to be mindful of where you store your financial and personal documents. All documents that have your financial account numbers and social security numbers should be kept in a secure area inaccessible to others. This includes: paper checks, bank statements, tax return forms, wills, pay stubs, etc. For documents you wish to dispose of, use a paper shredder to destroy the items prior to throwing away. With our Online Banking, we have strong password requirements to help protect your account from outside invasion. We recommend you use a mixture of upper and lower case letters, numbers, and special characters to make your password secure. Avoid using common used words such as “password” or using parts of your username, your first or last name or the names of children or pets. 5. Be Cautious of using Unsecured Wi-Fi Networks. Almost all places provide a free wi-fi signal as a thank you to their customers but we discourage you from using an unsecured wi-fi signal to do anything confidential such as looking up banking information. Hackers have the ability of intercepting unsecured wi-fi communications. 6. Monitor your credit and banking accounts. It is suggested that you monitor your credit accounts from one of the 3 credit bureaus every 6 months. Scan your report to make sure everything listed is an account that you have opened and are aware of. If you see anything suspicious, contact that credit bureau immediately. You can obtain 3 free credit reports (one for each of the credit bureau’s) at https://www.annualcreditreport.com/index.action . It is also important to check your bank statement via online banking or paper statements every month or more. Check what has cleared against your checkbook register to make sure all transactions are ones that you have performed. If you see a transaction that you have not done, you must notify the bank within 60 days of receiving the statement. If notified during this time frame, the bank will be able to work with you on a dispute for any fraudulent charge. 7. Be aware and protect yourself from Phishing scams. Phishing is the practice of sending out emails that contain links or promotions convincing the recipient to click on them which then creates viruses on the users computers. Other types of phishing involves asking for financial information, money grams, or wires via email or telephone call. Be aware that Brighton Bank will never contact you requesting your personal information. If you receive a suspicious call from someone claiming to be from Brighton Bank, please hang up and call us directly. We also advise our customers to never send money orders or wires to people or businesses they are unfamiliar with. If you believe you have been a victim of identity theft, notify the three credit bureaus and Brighton Bank immediately. Contact information is listed below. * Quickly respond to any IRS mailings and complete IRS Form 14039, Identity Theft Affidavit. * Contact us immediately so that we can flag your account with a special alert. * Continue to complete your IRS Tax Returns and pay your taxes, even if you have to do so by paper form. July 4- Celebrate Independence in Munford 8:30p.m.